Is the subscription service worth it? You be the judge. 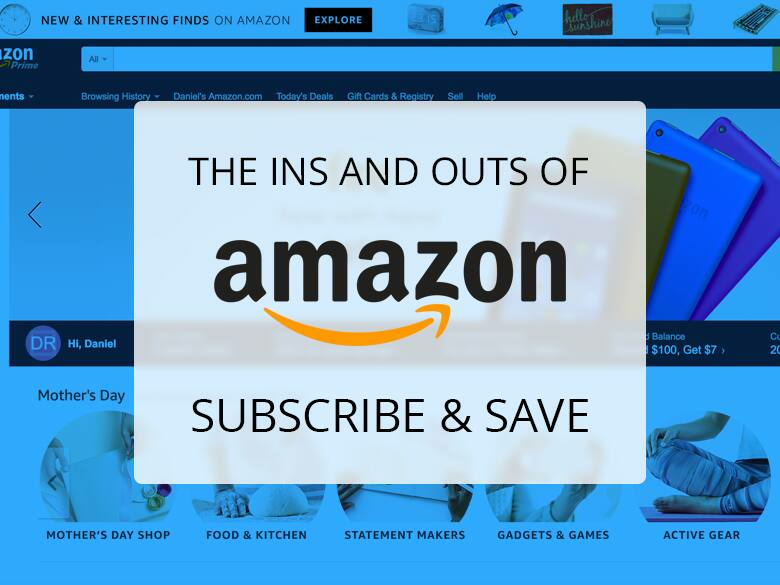 We decided to demystify Amazon Subscribe and Save by breaking down all the must-know details. If you're looking for a little clarity, you've come to the right place. 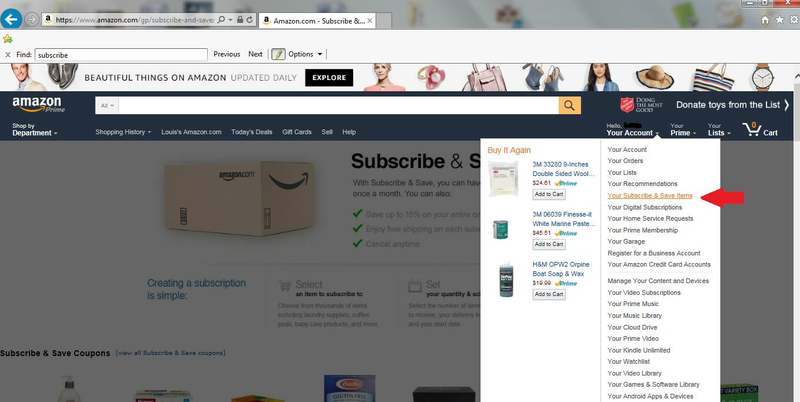 How Does Amazon Subscribe and Save Work? Subscribe and Save is pretty much what the name implies — an online shopping service that allows users to subscribe to items they frequently buy, then set up auto-delivery so that these items arrive as often as they'd like. Delivery windows are set up in month-by-month increments, with the shortest window being once a month and the longest being once every six months. But the real savings come in when you hit the five-item mark. Subscribing to five or more items to be delivered together bumps your discount up to 15% off. The key here is that in order to get that 15% discount, all five subscriptions have to come on the same monthly delivery date. Want toothpaste delivered every two months? Or paper towels on your doorstep every three? Subscribe and Save lets you set it up in just a few clicks. There are literally thousands of eligible items you can subscribe to, from grocery items to beauty products to pet supplies. 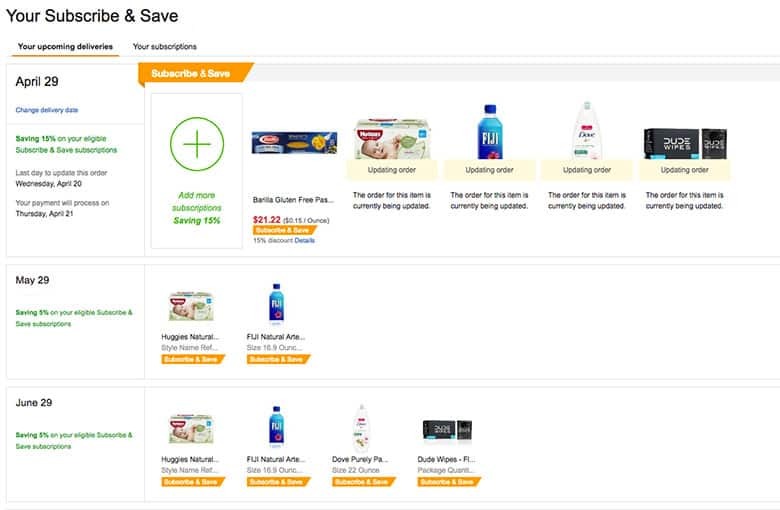 Even many of those little Amazon Add-on items, which normally require a $25 minimum purchase, are eligible for Subscribe and Save. In addition to the convenience factor, the free program also doles out some pretty impressive savings; if you know how to snag them. The number of items you choose to subscribe to is entirely up to you, but just know that the more you select, the more you save. If you have up to four subscriptions set for one delivery, you'll automatically get 5% off plus free standard shipping. (Sorry, subscriptions don't qualify for Prime Two-Day Shipping.) But the real savings come in when you hit the five-item mark. Subscribing to five or more items to be delivered together bumps your discount up to 15% off. The key here is that in order to get that 15% discount, all five subscriptions have to come on the same monthly delivery date. On months where, say, only four items come, you'll only get 5% off. Still, for items you were planning on buying anyway (think household staples and toiletries), Subscribe and Save may be worth considering. Another detail to keep in mind, though, is that if you run out of an item in the middle of your delivery cycle and can't wait until the next cycle begins to adjust your delivery frequency or the quantity of the item being delivered, you'll be on the hook for the refills. This means no free shipping, unless you have Prime and order it that way. 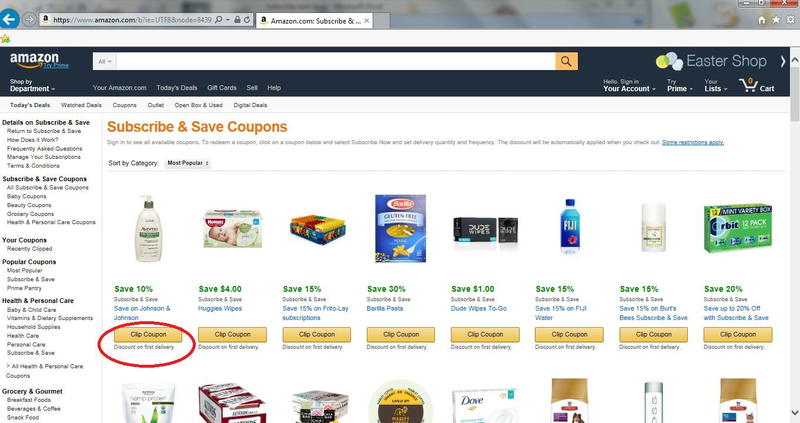 Can I Dial Up Savings by Stacking Amazon Coupons? See a coupon that catches your eye? Simply click the "Clip Coupon" icon to redeem it. After subscribing to the product, the discount will be applied to the next delivery. When it comes to stacking these savings, the 5% discount (or 15%, if you have at least five items in your shipment) will be applied before any coupons. Also, these coupons are for one-time-use only and will not apply to future deliveries of that item. So if you subscribe to a particular item because there's a great coupon available, be sure to cancel it after you receive that first shipment. How Do You Change a Delivery Date? Once you subscribe to an item, you'll see that monthly delivery is the most common option. But you're in no way locked into this timeframe. 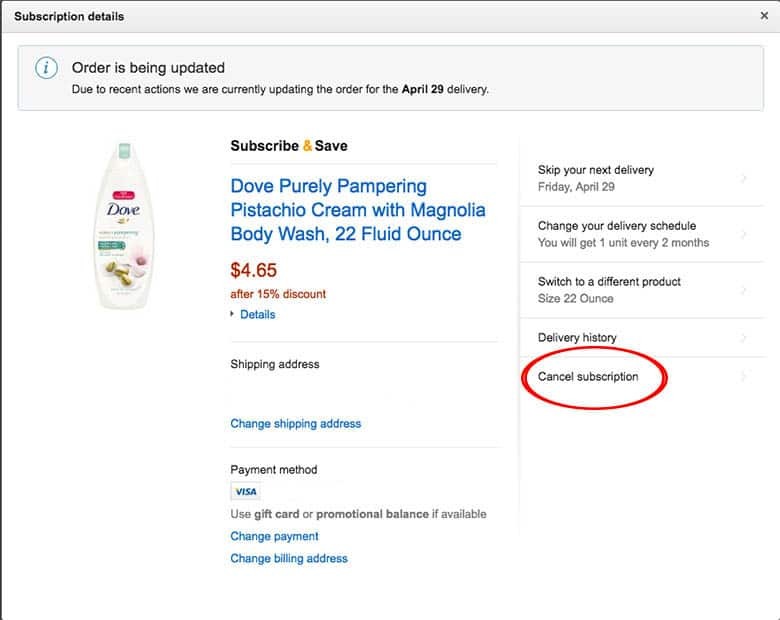 Adjusting delivery dates or frequency of deliveries is easy; you can modify different aspects of your subscriptions (or cancel all together with no penalty) via your Amazon account settings. From there, the next steps are self-explanatory. Are Subscription Prices Locked in When I Order or Can They Change? Prices are locked in for your first order, but not on subsequent orders after that. When you subscribe to an item, your credit card isn't actually charged until that item is shipped. This is precisely why it's a good idea to take a peek at your upcoming orders just prior to delivery to check on any significant price jumps. If you catch a spike, you can call off the delivery. On the flip side, you may end up cashing in with a lower price than you started with. This is actually a pretty headache-free process. Simply go to your Subscribe and Save items, hover over the subscription you want to cancel, click edit, then click cancel. There are absolutely no fees or penalties for doing so. Hover over the subscription you want to modify. So, does it sound worth it? It depends on what you're ordering. For some items, you may actually be able to save more cash at your local warehouse club, but if you do a little research ahead of time and take advantage of coupons, there are definitely good deals to be had. And even if you can save a few pennies at a brick-and-mortar store, the convenience and decent-enough savings may be enough to sway some potential new customers. Have you given Subscribe and Save a try? What's your take? Click here to see all Amazon Slickdeals!